Perched high up on the mountain, Les Hauts-Bois residences offer breathtaking views of the Laurentian region. 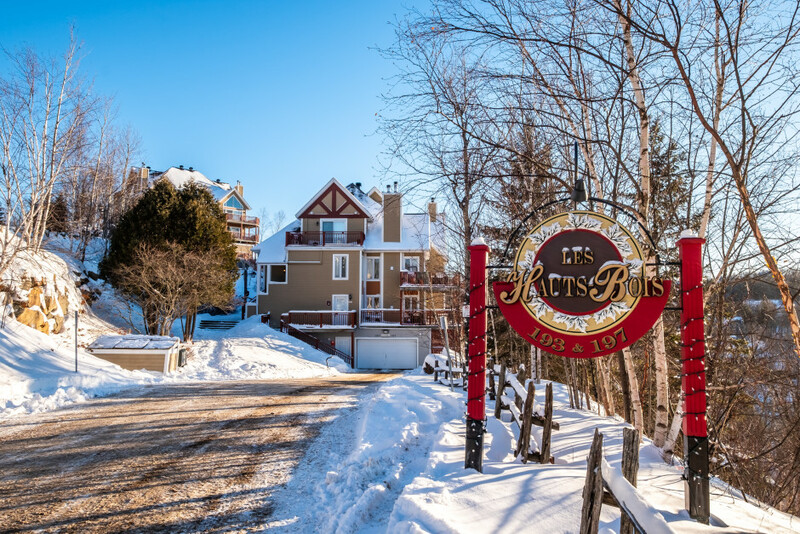 Located in a natural wonderland, close to Parc national du Mont-Tremblant, and only minutes away from the action-packed pedestrian village. 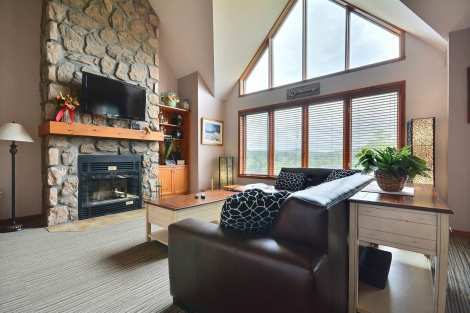 This specific 2-bedroom Haut bois 197-9 is an end unit condo, with extra privacy, large deck, with gas BBQ, providing wooded views of the valley and Lake Tremblant. Open concept living room/ dining room/ kitchen. with wood fireplace. High speed wireless internet, phone service to Canada & continental US & cable service in living room with DVD & VCR players, TV in master bedroom. Interior parking space and storage space for skis. Ski-in ski-out with easy access to Porte du Soleil Chairlift Free shuttle also available. Outdoor pool and spa available during summer months. Perched high up on the mountain, Les Hauts-Bois residences offer breathtaking views of the Laurentian region. 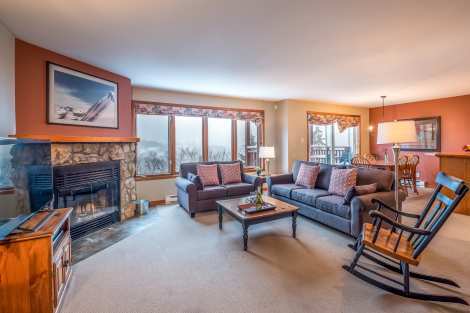 Located in a natural wonderland, close to Parc national du Mont-Tremblant, and only minutes away from the action-packed pedestrian village, each of these ski-in/ ski-out luxurious 2 or 4-bedroom homes features a cozy living room with a fireplace, a TV, a fully-equipped kitchen and a washer/dryer. Additional convenient amenities include an outdoor pool and indoor parking. Property Bonus: Haut-Bois 193-3 is a very proper country-style unit, which has a beautiful view and flat screen TV. 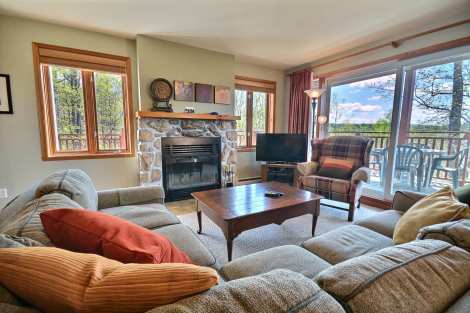 It is spacious and bright and is 10-15 minutes walking distance from the resort. Free shuttle service is available and you also have access to the outdoor pool during the summer. Gorgeous condo on 1 level with wood floors, interior parking and a short walk to the pedestrian village. Perched high up on the mountain, Les Hauts-Bois residences offer breathtaking views of the Laurentian region. 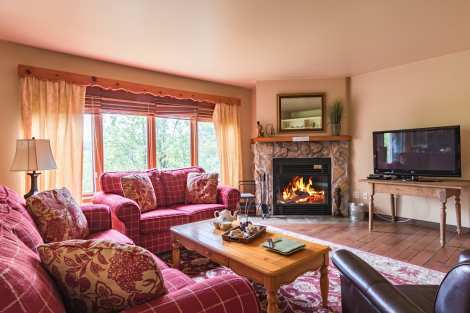 Located in a natural wonderland, close to Parc national du Mont-Tremblant, and only minutes away from the action-packed pedestrian village, each of these ski-in/ ski-out luxurious 2 or 4-bedroom homes features a cozy living room with a fireplace, a TV, a fully-equipped kitchen and a washer/ dryer. Additional convenient amenities include an outdoor pool and indoor parking. Property Bonus: A very spacious and bright unit with cathedral ceilings, a master bedroom loft with ensuite, a large balcony and access to the pool. It is 10-15 minutes walking distance to the resort village or you can take the free shuttle service.